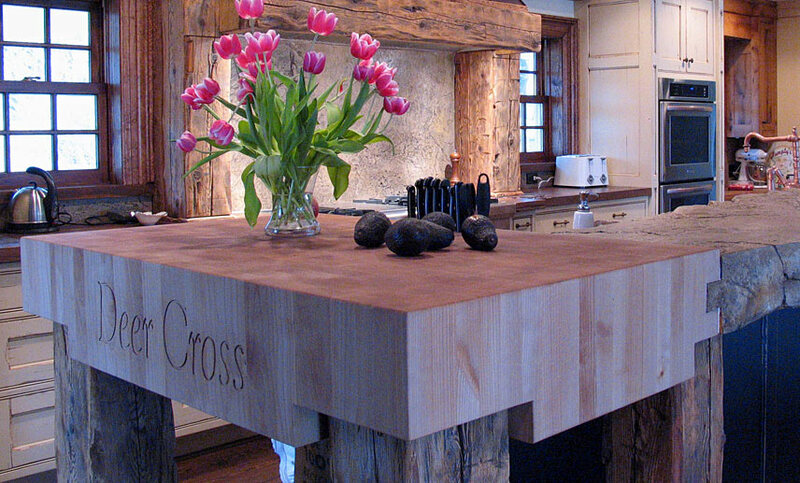 The Grothouse Custom Wood Countertops Blog features the industry’s most talented and innovative designers throughout the United States and abroad. 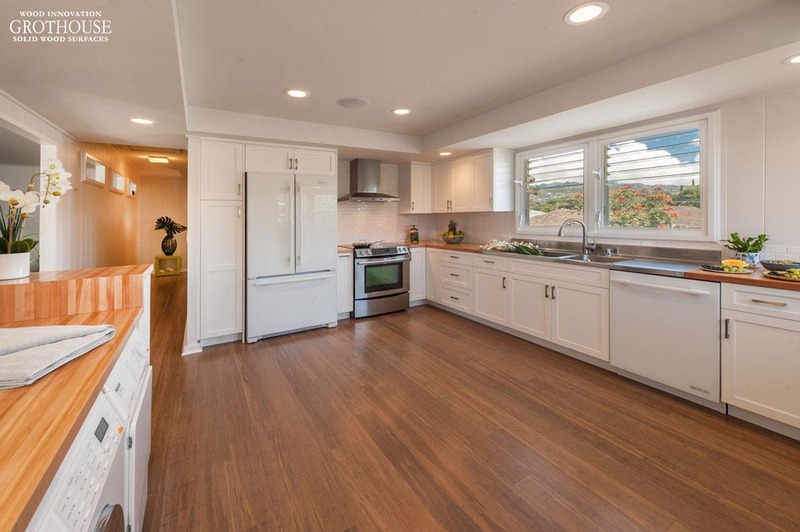 This week, we are featuring a Kaimuki Bungalow kitchen that includes American Beech Wood Countertops designed by Tiare Noelani Pinto, CKD, Allied ASID, CGP, of Archipelago Hawaii. About the Designer: Tiare is the Co-Founder and President of Archipelago Hawaii. 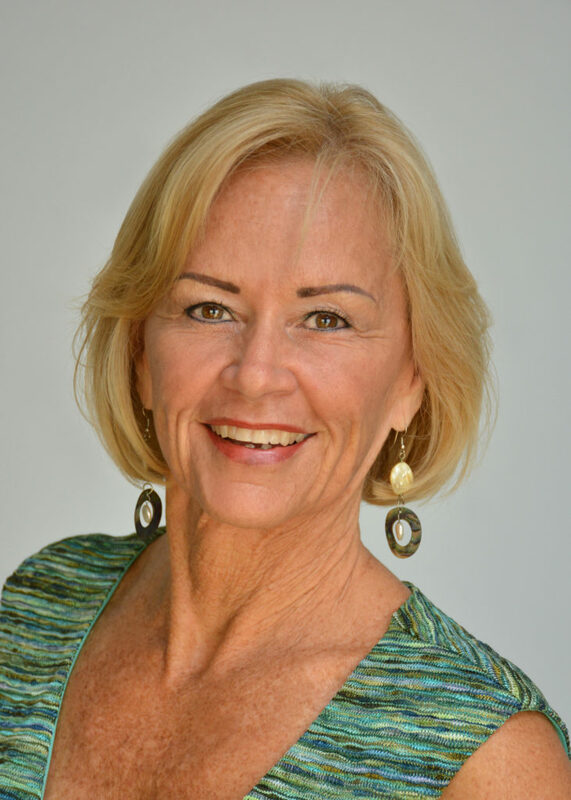 She is a Certified Kitchen Designer (CKD), Certified Green Professional (CGP), and holds a certification from the Allied American Society of Interior Designers (Allied ASID). Tiare’s unique background includes kitchen and bath as well as interior design. She has extensive savvy in both ground-up construction and remodeling. Tiare has served as a designer in the fields of graphic design, furniture, fabrics, kitchens, bathrooms, high-end residential and commercial design. Check out Archipelago Hawaii on the following platforms for further design inspiration: website, Facebook, Houzz, Pinterest, and Instagram. 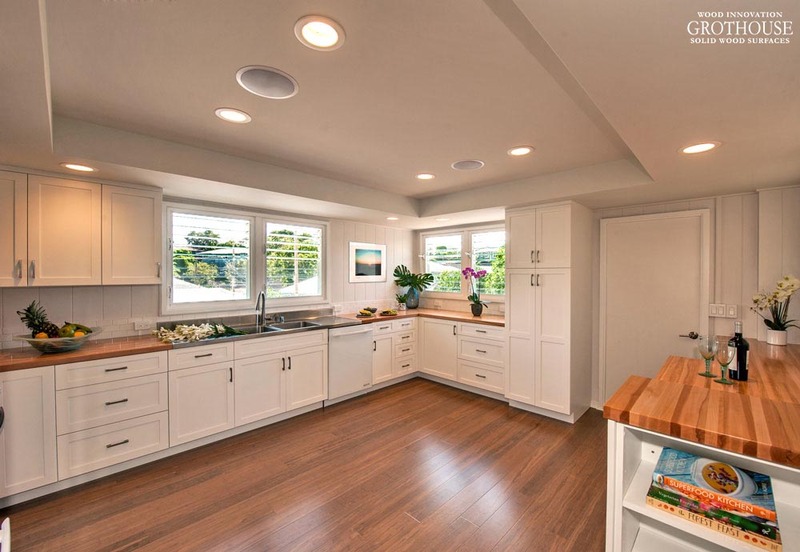 To see more kitchen designs with American Beech Countertops, visit the Grothouse Countertop Image Library. Light Wood Countertops are naturally very warm, comforting surfaces that can be designed to fit any space. The five most popular light colored wood species at Grothouse are Alder, American Beech, Ash, Maple, and White Oak. The first Light Wood Countertop Specie listed is Alder. There are two types of Alder species available at Grothouse: Knotty Alder and Superior Alder. Both are very light in color and make for great counter surfaces. Knotty Alder is shown in the image above. 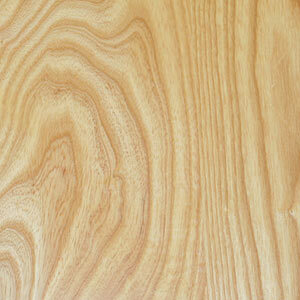 Knotty Alder typically ranges from a pale yellow color to a light red-brown. Knotty Alder Wood Countertops can be crafted in any construction style: End Grain, Edge Grain, Flat Grain. Below is an Edge Grain Alder Wood Countertop. Superior Grade Alder is also available at Grothouse. It is shown in the image below. Superior Grade is the highest grade of Alder. It is similar to Knotty Alder, but does not contain knots. It ranges in color from pale pink-brown to light brown. 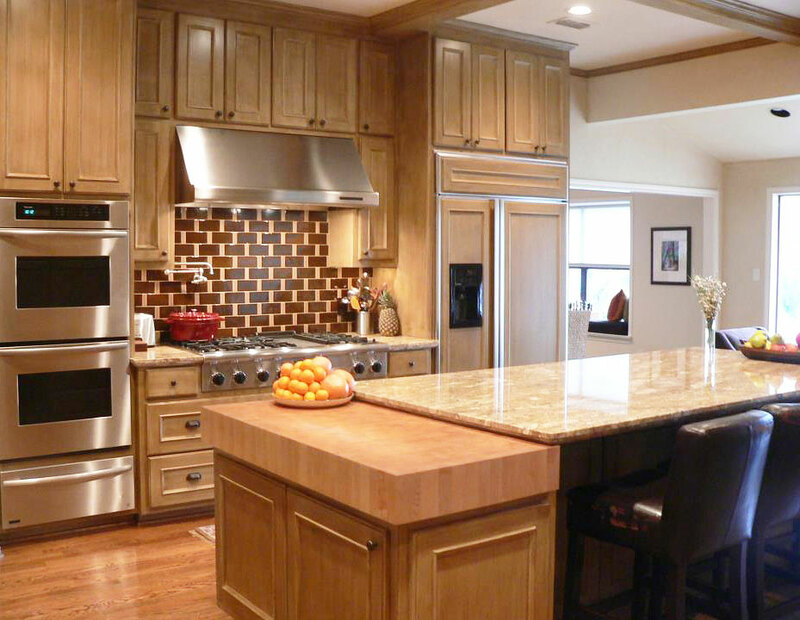 Superior Grade Alder wood countertops can be crafted in End Grain, Flat Grain, and Edge Grain Construction. Below is an image of a Superior Grade Alder Butcher Block made in End Grain Construction. The second Light Wood specie available is American Beech. 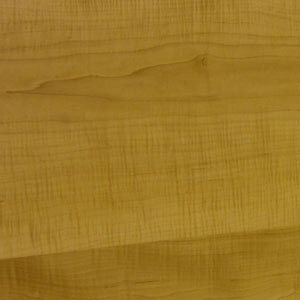 American Beech is typically light tan to light brown in color. 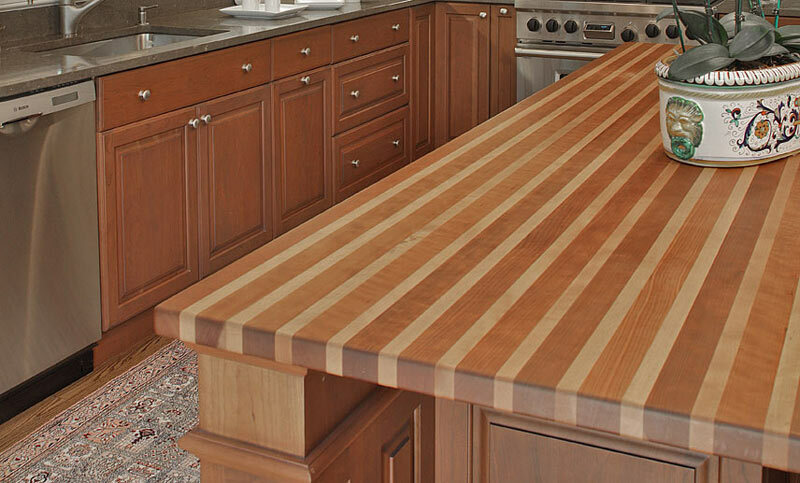 American Beech Wood Countertops are only available in Edge Grain and End Grain. 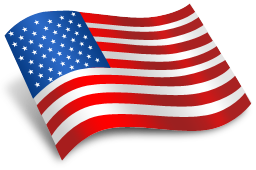 Due to inconsistent supply, Grothouse does not offer American Beech in Flat Grain. Below is an image of an Edge Grain American Beech Wood Vanity Countertop. The next Light Wood Countertop specie available is Ash. Ash is very light in color, ranging from white-tan to pale yellow, light to medium brown. Ash Wood Countertops can be crafted in any construction style: End Grain, Edge Grain, Flat Grain. That being said, Ash Wood Countertops can be finished with either Durata Permanent Finish or Grothouse Original Oil. 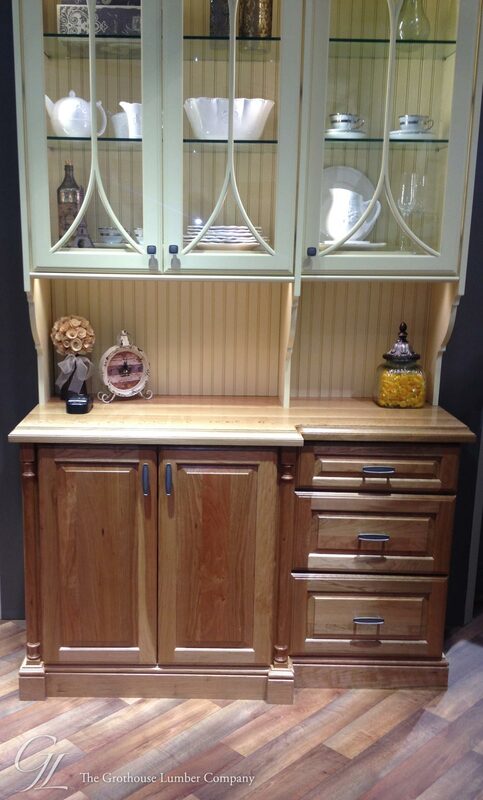 Below is an Ash Light Wood Countertop used for a kitchen island and seating area. Maple is the most popular light wood specie chosen for countertops. Maple is a uniform pale red-brown or light tan. The sapwood is white with a red tinge. 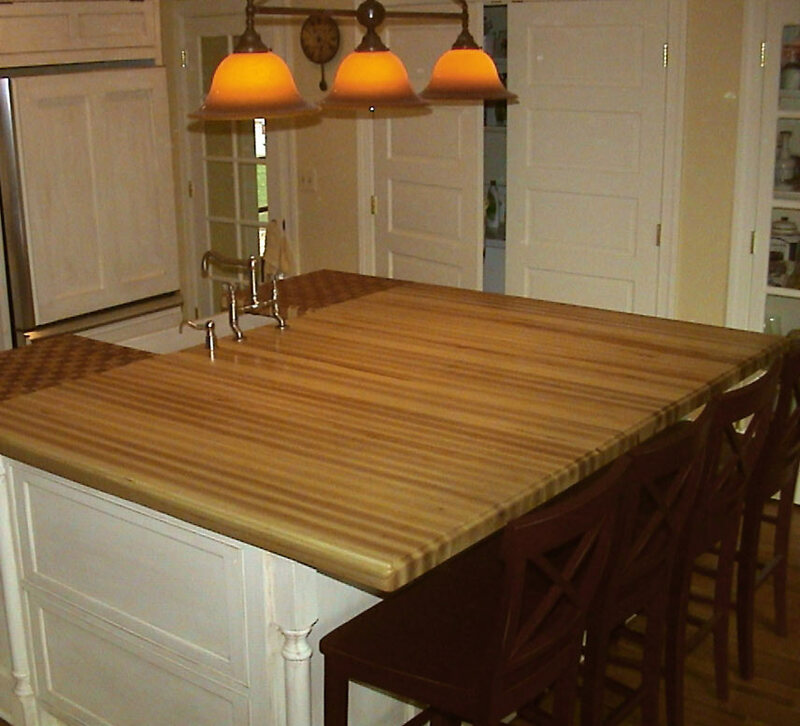 Maple Countertops can be crafted in Edge Grain, Flat Grain, and End Grain Construction. 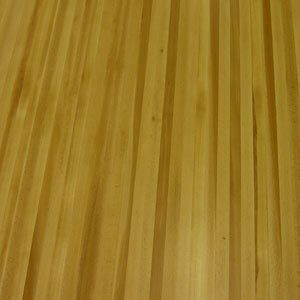 Below is an image of Edge Grain Maple Wood Countertops. Maple Countertops are also available in End Grain Construction. Below is an image of an End Grain Maple Butcher Block that is a Light Tan color. 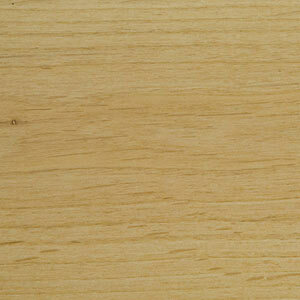 White Oak is the fifth most popular Light Wood Countertop specie. 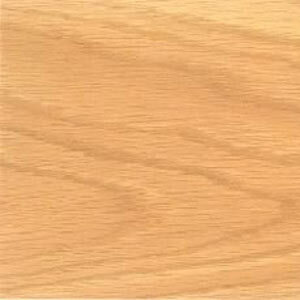 White Oak Countertops range from light tan, light brown, pale yellow-brown to dark or pale brown. Below is a Quartersawn White Oak Wood Counter crafted in Flat Grain Construction. 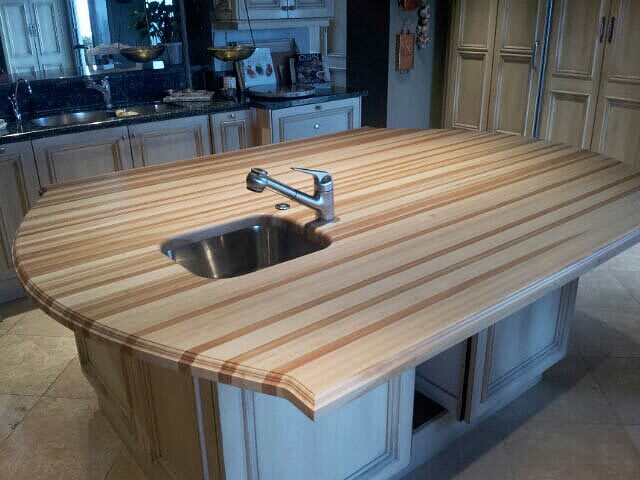 This countertop was featured in the Elkay Display Booth at KBIS 2014. Light Wood Countertops are the perfect component to any space to bring warmth and comfort. The five most popular Light Wood Countertop Species available at Grothouse are Alder, American Beech, Ash, Maple, and White Oak. 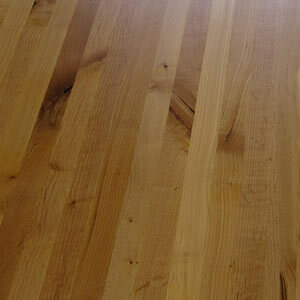 The Grothouse Countertop Image Library contains more images of Light Wood Countertops. Grothouse Beech Wood Countertops are typically light in color. Their light color is very comforting, giving them the ability to compliment any space, any style. 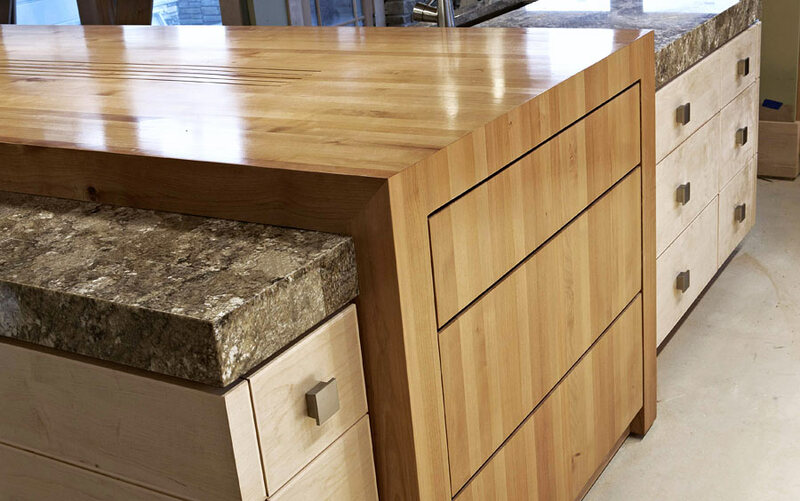 Grothouse Beech Wood Countertops are available in Edge Grain construction and End Grain construction. Beech Wood Countertops are typically used as kitchen island countertops. Palmer Todd designed this Beech Wood Countertop for a large kitchen island in San Antonio, Texas. This countertop was crafted in Edge Grain construction. It includes a Standard Double Roman Ogee edge profile and an undermount sink. 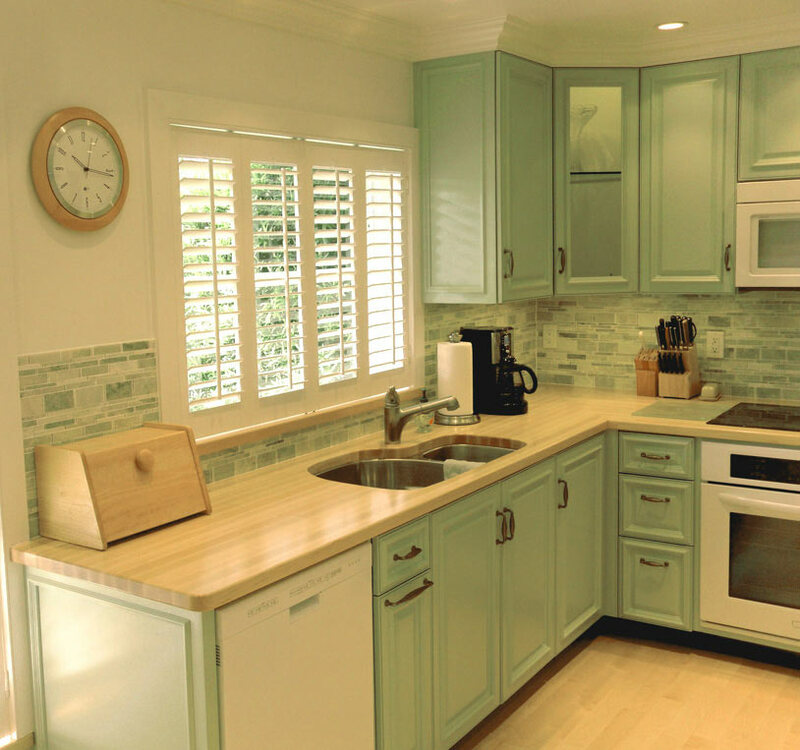 This Beech Countertop compliments the light colored cabinetry in this traditional kitchen. Julie Fergus of American Home Gallery designed the beautiful and calming kitchen design pictured below. The Beech Wood Countertop in this kitchen adds a comfortable seating area. 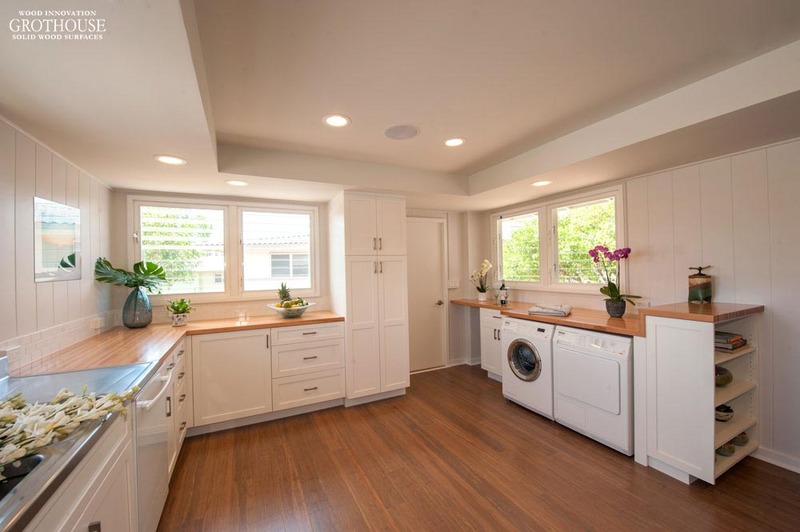 It compliments the bright white cabinetry and stainless steel appliances. Echelon Custom Homes designed this Beech Wood Countertop to be used for a Bathroom Vanity. 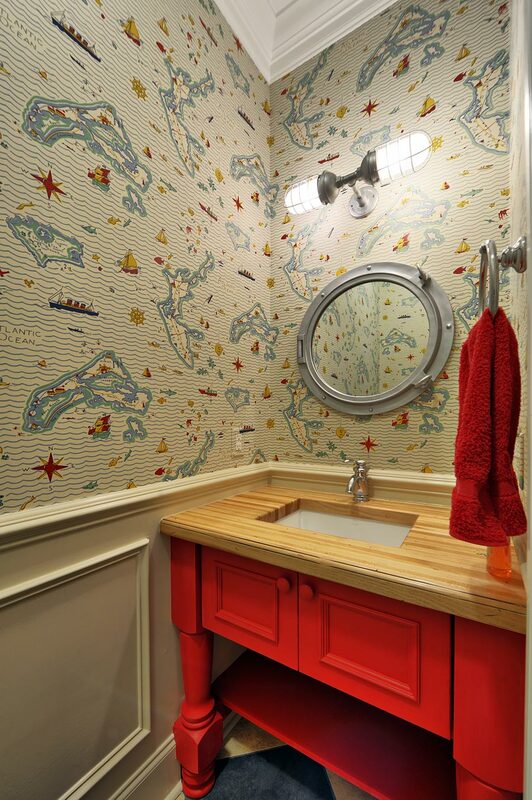 This vanity countertop is a result of a talented vision. Each element of this bathroom only reaches its full potential when combined with all the components as a whole. The Beech Countertop compliments the colors in the lovely wallpaper, which has flecks of colors that pick up the balance of design elements. The bright red vanity base adds a vibrant pop of color. Beech is also typically paired with another wood specie(s) to create a wood countertop with a beautiful and unique pattern. This countertop is a perfect example of that. Beech was paired with Cherry to create a striped pattern. Jenny’s Design Build designed this butcher block countertop to include a pattern with Beech, Wenge, and Walnut wood species. The combination creates a checkerboard pattern along the border of the countertop. 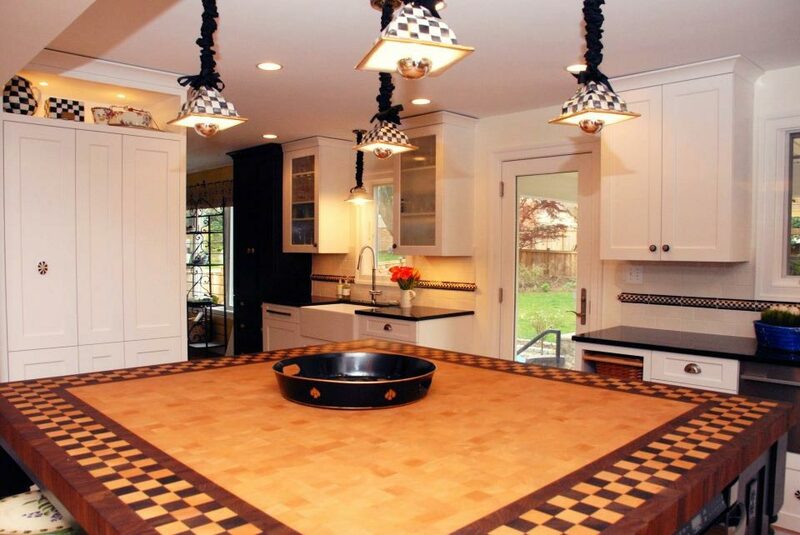 The checkerboard pattern compliments the design elements in the kitchen. Grothouse Beech Wood Countertops are typically used as kitchen island countertops. They are also typically paired with another wood specie(s) to create a pattern design. 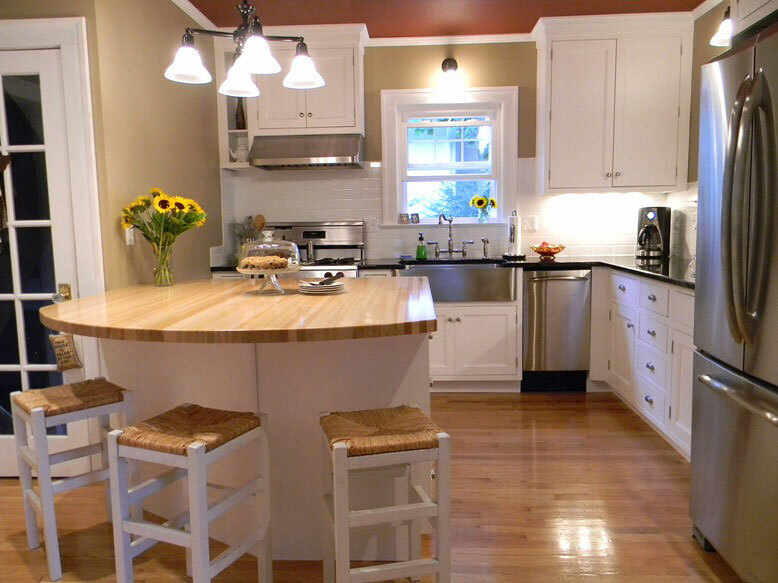 Beech Wood Countertops are designed to bring comfort to any space. They are complimentary to any space, any style design. To see more images of Grothouse Beech Wood Countertops, visit our Image Library. Established in 1994, the Grothouse Lumber Company has grown to become one of the most technically advanced and creative manufacturers in the wood surfaces market. Our custom-built wood countertops can be configured with various options, including 60+ wood species, and 30 edge profiles. Our specially-formulated Durata; permanent finish is one of the most durable and waterproof protective coatings currently available on the market today.